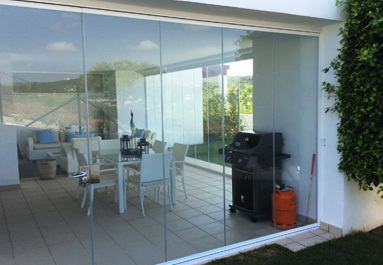 ⊛Why choose us as your Glass Curtain Company in Sotogrande? Glass curtains in Sotogrande by the hand of a company with experience and a team formed by professionals and specialists in enclosures. More and more people are deciding to install glass curtains in their homes. The fact is that glass curtains have become a home accessory that brings great advantages and comforts. At TecnoPVC, we know the importance of being able to have a balcony, terrace or closed glass patio, and even more so when you don’t have to give up on aesthetics and quality. With us, you will have glass curtains in Sotogrande at a very competitive price and with an excellent guarantee in quality and materials. If you are thinking of making a change in your balcony, contact us without any obligation and we will answer all your questions. We offer you a glass enclosure with no profiles, which will be totally adapted to your needs and to those of the space where it will be installed. We work with major brands that make it possible for us to both offer variety and provide perfect glass curtains in Sotogrande. Get a new room in your home without loss of space and with an incredible aesthetic result. Let our experts in glass enclosures and glass curtains advise you. 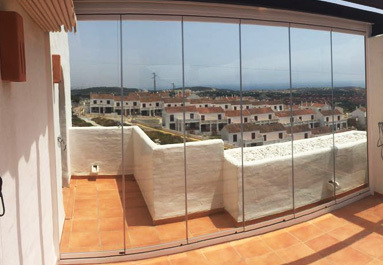 Are you thinking of installing glass enclosures in Sotogrande? Then you are in the perfect place. At TecnoPVC, we are experts in glass enclosures and we provide a fast, professional and efficient installation service. We take care of every detail of the installation so that the result meets all your expectations and you get to enjoy the quality and advantages of glass curtains. The enclosures or glass curtains are without a doubt a great choice, as they will allow you to enjoy your terrace or balcony every day of the year, regardless of the outside temperature. In addition, the quality of the materials allows us to offer glass curtains with a greater degree of acoustic and thermal insulation. At TecnoPVC we offer glass curtains with no profiles so that they can be unfolded completely and you get to have complete use of space. 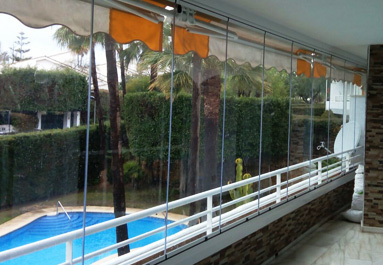 If you need a glass curtain company Sotogrande, find out more at TecnoPVC. We are specialists on the subject. Put yourself in the hands of a glass curtain company in Sotogrande that is recognized for having a long career path and a wide range of satisfied customers. If you are looking for quality, elegance and safety in a glass curtain, we are the perfect company for you. Contact us without any obligation and our specialists will advise you on what you need. We are a glass curtains company in Sotogrande that is recognized for working with major brands: Kömmerling, Strugal and Guardian Glass. We use quality raw material to provide our customers with double glazed glass curtains, and a safer and more resistant glass. At TecnoPVC, we offer a glass enclosure according to your needs and those of your balcony or terrace, whether it is panels, dimensions, distribution, etc. And in order to provide the best aesthetic result, we have a team of experts in installation and assembly of glass curtains in Sotogrande. If you want to change the aesthetics of your balcony or terrace, and you are thinking about glass curtains, contact us without any obligation and we will answer all your questions and advise you on everything you’ll need. We have a extensive experience in installation of glass curtains. We offer glass enclosures manufactured with the best materials.